If you are someone in the online marketing and similar business, staying connected to your audience is one of the important aspects of taking it forward. Emails are the most widely used modes of communication when you are in an online business. Emails are known to produce the highest possible ROI and have been well known for a higher degree of delivery capability. But, unlike your regular emails at a personal level, a business email campaign cannot be something that you can handle with a manual mode. Of all the email delivery services, one of the best options we liked the most is SendPulse which is a Multi-Channel Marketing Platform. We will get to know the software in finer detail. SendPulse – What It Is? 1 SendPulse – What It Is? SendPulse is your one-stop solution for all your marketing requirements. 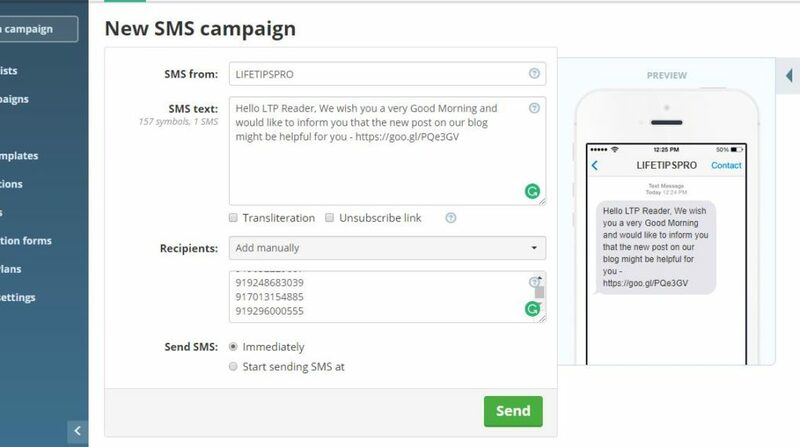 A multi-channel marketing companion for all your needs, it offers you integrated messaging services and aids you bulk SMS, Bulk Email, and web push notifications. It will take care of all your needs in getting in touch with your audience and staying in contact with them. It offers you several options in terms of online marketing including email templates, reporting and other needs in a capable email marketing. In fact, though email has been one of the preferred communication systems, it is not sufficient for all your marketing needs; you need to have access to other channels like SMS and Web Push Notifications. We will check out each of the features that SendPulse offers one by one. Email service is one of the major functions of SendPulse. Some of the excellent options that it offers with respect to the Email marketing can be summed up as discussed here. Email open rate forms part of an important metric for an effective email marketing. SendPulse makes use of artificial intelligence to improve the email open rate. It has been observed to offer increased email open rates up to 30%. The AI system analyses the user behaviour with respect to the previous mail and based on the analysis prefers another good time to send messages. 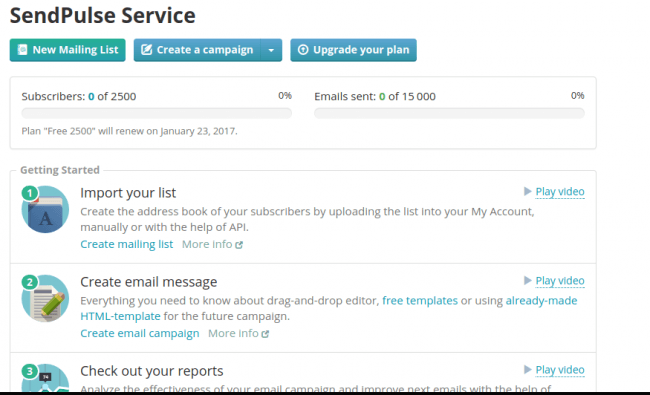 SendPulse offers you automated email sending options. There are several triggers you can rely upon. In fact, automating your emails will have a host of preparations that go behind it. With SendPulse, you can consider opting for three options in Email Marketing – Automation Series, Special Date and Triggered Email. In terms of Automation Series, you can set a series of emails one after the other. A prime example can be the newsletter subscriptions. You may also send emails based on the specific days to the client. A good example can be birthdays, anniversaries or launch dates. The triggered emails come under condition based options. These can be sent when certain conditions are met. For instance, you can send further mails when one of the mails is received, or a link clicked. A/B Testing is a way to check the exact strategy that may or may not work. Send a particular type of email template to around 15% of your audience. Send the second template to another 15%. The performance of the two templates can then be tested with respect to the click-through rate, email open rate and unsubscribe rate give you an insight into which template works. Web Push Notifications have been a new trend in online business. It improves the number of returning visitors to your website. A web notification is all about a small notification about some information on your site. It can be a little tidbit about a new article published on the site or an input into a new product launched. 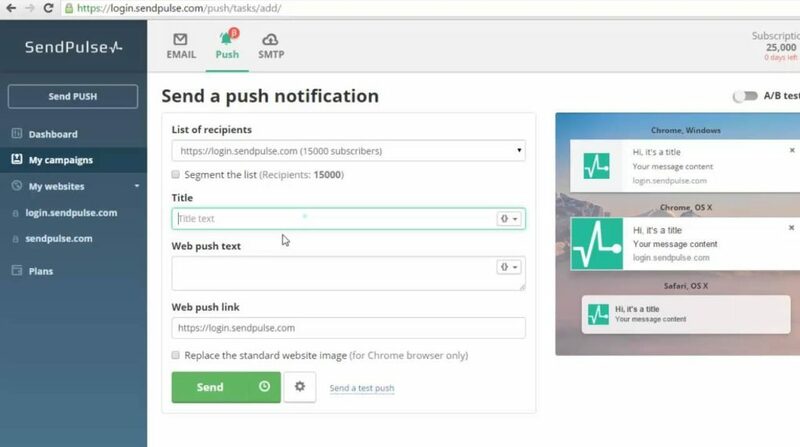 SendPulse offers web notifications for free. You just need to implement a code provided by the SendPulse dashboard. If you are on WordPress, you may use the free web push plugin for WordPress. These short messages can be sent on the common browsers – Google Chrome, Safari, and Mozilla Firefox. This is yet another excellent option for online marketing. In fact, this is a major service that makes it an excellent option. Just create a mailing list and include the phone numbers of your audience. You may add the phone numbers by uploading a file containing the mobile numbers, importing them from any other source or add them manually. SendPulse can handle SMS at the rate of 300 to 500 per second. It does support over 800 different networks spread across over 200 nations. You can either send the messages immediately or schedule them. The personalisation options are also available for the messages by means of adding recipients’ name or other preferred information. It is an integrated platform for sending bulk emails, bulk SMS messages and web push notifications. Opting for a combination of all these services in one package should ideally offer you an excellent option. You may opt for the Automation 360 for combining all the three features together. It would also be helpful in keeping track of the conversions. You can send different messages depending upon the separate events, variables and conditions. It is evidently the best service for your needs. What’s more, it was one of the three finalists at The Next Web SCALE 2016 program. One of the best startups in 2016, SendPulse offers you excellent packages. In fact, to commemorate the success of the firm from its start-up days, they have also launched a Startup Accelerator Program that will reward a grant of $5,000 for developing email marketing. The web push notifications are available for free. In fact, you can opt for the web push notification alone if you so wish. The Email and SMS services are available at differential pricing depending upon the number emails and SMSs you tend to send. Sending 15,000 emails per month will be free if you have fewer than 2,500 subscribers. There is another pay as you go or Monthly subscription options as well. The SMTP service is available at 12,000 free per month. Messages beyond that will attract a monthly subscription or a pay as you go plan. That should be the largest quota on its free plans for email and SMTP services and with the least functionality restrictions. Why is SendPulse a great option and why would we recommend it to you? Well, we have outlined all the features and services that SendPulse has on offer for you. We would definitely suggest you give it a try as it is one of the excellent choices in its own right. It is affordable and offers you a one-stop solution for email, SMS and web push notification in one single package. Opt for it today, and we are sure you will have no regrets ever!